My kids all enjoy playing the piano and I enjoy teaching them. 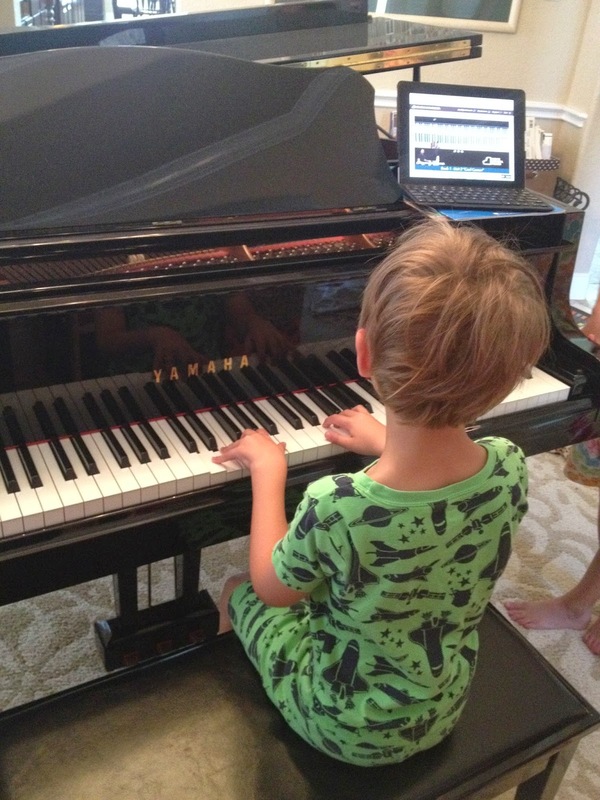 But we were thrilled to have online piano lessons through our review of HomeSchoolPiano lessons! We received a life time subscription for HomeSchoolPiano – Complete Set of Books. HomeSchoolPiano is a series of online piano lessons. The instruction starts with piano basics for the new beginner and progresses through more advanced techniques and songs. The lessons are taught by Willie Myette, a jazz pianist, who is a graduate of Berklee College of Music. HomeSchoolPiano has a Complete Set of Books that includes all the lessons for beginners through more advanced players. Each lesson ranges from 5-10 minutes and includes a screen shot of a keyboard with a small picture of Willie at the bottom to allow the student to see the proper technique demonstrated by Wille as well as which notes are to be played on the keyboard. The lessons are geared for students of any age – from the youngest beginner to an adult beginner or even someone who is wanting to improve technique or learn improvisation. The program includes CorePiano which are the basic lessons for the beginner pianist. In these lessons, Willie explains the basics of piano such as note names, types of notes, rhythm, proper playing technique, key signatures, the grand staff, scales, and chords. There are 33 lessons in this series. The other portion of the program contains the lessons which are divided into 3 separate books. Book 1 is for beginners who understand basic note reading and technique. Book 1 students learn to read music through playing six original pieces. In addition, students are introduced to the basics of improvisation. Book 2 teaches additional songs as well as focuses on rhythm, technique, note reading, and more improvisation techniques. Book 3 is for more advanced students. In book 3, students are taught how to create musical arrangements in a variety of musical styles. Each book also includes a printable e-book to have the songs and pages to record songs and improvisations. We received access to the online piano lessons for 5 students. I was able to place my children in the level that best fit their abilities. Curly (age 8) – She began in Book 1 because she has mastered the basics of technique and note reading. Tiger (age 6) – He worked quickly through the CorePiano lessons before starting in Book 1 to make sure that he understood the basics. 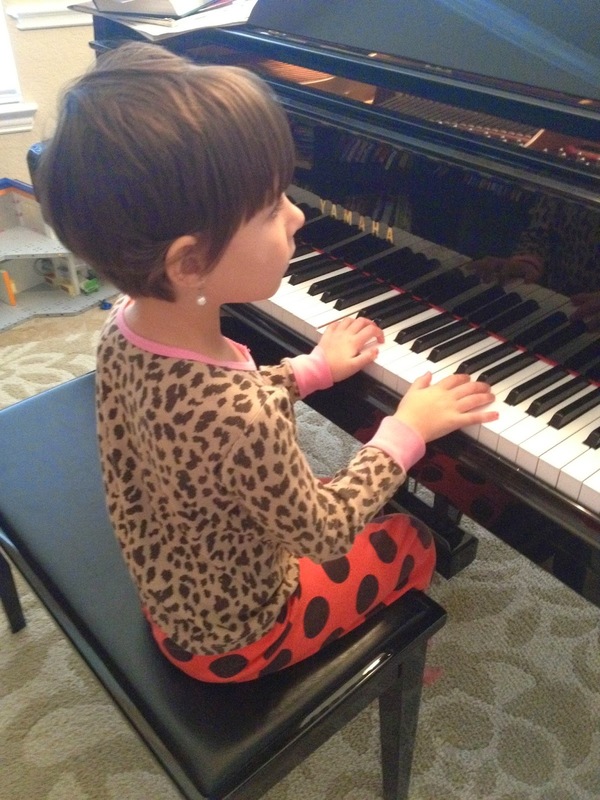 Bee (age 5) – She worked on the CorePiano lessons. Prince Charming (I won’t tell his age) – Yes, my hubby wanted to take lessons for piano. He began with the CorePiano lessons since he has no prior piano playing experience. I had fun working through the improvisation sections of the lessons in Book 1. Even though I had piano lessons for 12 years, they were traditional piano lessons and I did not learn how to improvise, play jazz piano, or create my own musical arrangements. I found that Curly did well in Book 1 and was able to complete the lessons independently. She enjoyed creating her own songs and improvisations and performing them for us. Tiger and Bee both worked on the CorePiano lessons. I found that some of these were challenging for them because the program jumps right into note reading, sharps, flats, chords, and scales. The CorePiano lessons are like a quick overview of many basic principles but some were challenging for my young learners. My husband found that he was able to work through the lessons on his own because of the foundation that he received in the CorePiano lessons. My kids found Willie to be very engaging and clear in his explanations. He provides good instruction with demonstrations and examples. They were easily able to see what he wanted them to do or play. While the books are essential to the program, I did not enjoy having to print them out. It was also awkward and difficult to handle the books. I had to find a way to bind the pages together to create a booklet to use since the loose papers were hard to manage. Not all the pages face the same direction so we sometimes had to turn our book sideways to write on certain pages. I was wishing that there was a way to order a nicely printed and bound book for each child rather than print and bind the pages myself. The screen contains a picture of a keyboard as well as a small picture of Willie. As notes are played, they are highlighted on the keyboard at the top of the screen. It was extremely helpful to be able to see both Willie and the keyboard at the same time. This enabled us to see what we were supposed to do as well as she which notes to play. The lessons in the CorePiano portion begin with the very basics of technique which I found to be a helpful reminder for my kids. However, they do move rather quickly through note reading, scales, chords, key signatures, time signatures, the staff, etc. The lessons are short and clear. However, it is a lot of information without much review or practice for very young pianists. I found that since Tiger and Bee aren’t even reading on their own yet, it was a lot to expect them to keep up with learning to read notes, time signatures, sharps, flats, chords, and scales all within 33 short lessons. While I felt this program would work very well for slightly older kids (maybe ages 7-8 and older), it was challenging for my 6 and 5 year olds. The improvisation lessons were invaluable and were our favorite part of the program. None of us are familiar with jazz piano or improvisation. Willie clearly explained how to start improvising and he provided lots of practice and reinforcement. I found that my kids were able to start creating their own musical melodies right away after Willie’s encouragement. I loved how all the aspects of piano playing are addressed in the lessons. There are portions to practice ear training, technique, rhythm, and note reading. I felt that the program was very well-rounded with how Willie addressed all of these aspects of piano. I was able to create a separate account for each student so they could keep track of their own progress. When they logged in each time, it gave them the option to continue the last lesson. This was helpful as I often did not remember where we had stopped last time. However, the program took us to the last lesson that they had already completed and not the lesson that would come next in the sequence. While not a huge issue, it was a minor inconvenience to load that lesson and then move to the next lesson. We have greatly enjoyed this piano program. The lessons are short and clear. The teacher is engaging and provides excellent instruction. The program is thorough in teaching more than just reading notes, but addressing rhythm, ear training, and advanced techniques. The improvisation lessons are helpful and enlightening. Overall, this is a fun way to learn piano from a completely new perspective – through the eyes of a jazz pianist who teaches using unique rhythms and introduces tools to learn improvisation. Unlimited life-time access to HomeSchoolPiano along with all bonuses (downloads, jam tracks, sheet music) for up to 5 students. Thank you! We are enjoying the lessons!